Weblin is working with integrated development teams comprising user interface design, client/server development, verification, and documentation. This is the weblin scrum board. The board knows everything: who does what, when it's ready, what's next, which is delayed, what I do, how long it takes, and what's important. Each team has a board with lots of short tasks. 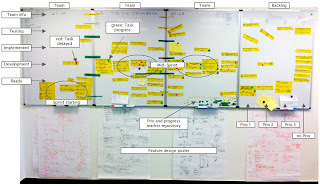 Tasks start in the backlog and move to the development ready state at the beginning of a 2 week sprint. The backlog is cleared occasionally and old never implemented tasks are removed and archived. During development we use the usual mechanisms and tools: unit testing, daily scrum meeting, pair programming, and feature reduction/expansion to meet the plan. Of course, there are surprises and unexpected developments and not every task goes as planned. That's the time of the Scrum master. The Scrum master notices and prepares a solution so that time is used as good as possible (sounds dry, but is actually quite lively). After implementation tasks wait for functional verification. When all tasks arrive in the tested state then the feature is ready for internal review. After the internal testing phase we create a release candidate (and sometimes more RCs) and deploy publicly.